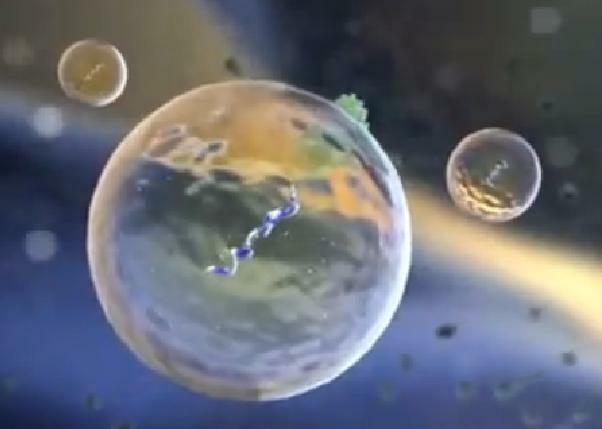 Caption: exRNA enveloped in a fatty bubble transmits messages between cells. Click here to view the video. When your email is interrupted or blocked, it creates havoc. Messages remain undelivered, stalling interactions between you and your friends, family, and colleagues at work. Likewise when communication fails between your body’s cells, disease can result. Scientists recently discovered a new group of molecules called extracellular RNA (exRNA) that appears to travel between cells to help them communicate. Now, NIH is encouraging researchers to explore the potential of these newly discovered messengers. Some of the RNA in a cell carries messages from DNA, and can then be translated into proteins in the ribosomes. But there are lots of other interesting categories of cellular RNAs—including those that don’t code for protein, but can control which genes are translated and how much of the proteins are produced. We once thought that the only role of RNA was inside the cell. But we’ve now discovered that cells can eject packets of exRNA encased within a spherical vesicle, or bound to other circulating proteins. These packets travel through body fluids, are taken up by other cells, and affect the behavior of organs at a distance. We don’t know much yet about this new family of exRNAs. But they appear to play both protective and pathogenic roles in health. Last year, for example, researchers discovered that human adult liver stem cells deliver microvesicles containing exRNAs to liver cancer cells. When these packages enter the targeted cells, the exRNAs kill the cancer cells, thus inhibiting the tumor from growing . However, it appears that cancer cells can also harness this phenomenon for their own benefit. For example, brain cancers called glioblastomas release packages of exRNA that encourage growth of the tumor . But in this case we might also be able to use these exRNAs to our advantage. Because they alert us to the presence of the tumor, we might be able to use these exRNAs as a diagnostic marker of cancer . Likewise other exRNAs could serve as biomarkers for other diseases, including heart disease, problems with the placenta during pregnancy, or Alzheimer’s disease. Finally, if we can understand this system better, we may be able to develop therapeutic exRNAs and deliver them in fatty droplets, just as our cells do naturally. We want to develop a catalog of all the exRNAs found in the body. We want to know which exRNAs are produced by which cells, and what their targets are. We want to know how these molecules travel though our body fluids (such as blood, saliva, urine, breast milk, and cerebrospinal fluid) and what effects they have on various functions. And we’d like to know if the presence of these messenger molecules is associated with specific diseases. The new Extracellular RNA Communication program,supported by the NIH Common Fund, will offer peer-reviewed research grants to explore these issues. We will announce the first set of awards soon. Later this year, NIH plans to ask researchers to catalogue all types of exRNA found in healthy humans; this will provide a baseline repertoire that we can compare with exRNA profiles from individuals with various diseases. We encourage researchers with expertise in RNA sequencing and bioinformatics to partner with exRNA biologists to take advantage of this exciting opportunity. For updates, check the NIH Guide and the Extracellular RNA Communication program page. If we figure out the basic principles of exRNA biology, we may someday be able to use these intriguing new molecules to diagnose, treat, and even prevent various diseases. Human liver stem cell-derived microvesicles inhibit hepatoma growth in SCID mice by delivering antitumor microRNAs. Fonsato V, Collino F, Herrera MB, Cavallari C, Deregibus MC, Cisterna B, Bruno S, Romagnoli R, Salizzoni M, Tetta C, Camussi G. Stem Cells. 2012 Sep;30(9):1985-98. Glioblastoma microvesicles transport RNA and proteins that promote tumour growth and provide diagnostic biomarkers. Skog J, Würdinger T, van Rijn S, Meijer DH, Gainche L, Sena-Esteves M, Curry WT Jr, Carter BS, Krichevsky AM, Breakefield XO. Nat Cell Biol. 2008 Dec;10(12):1470-6. Extracellular communication via microRNA: lipid particles have a new message. Rayner KJ, Hennessy EJ. J Lipid Res. 2013 May;54(5):1174-81.